Snacking? Yes. But the smart way please. Forget sweets loaded with sugar. Our snacks taste better and help you get fit. They sweeten the afternoon and fight the initial hunger after the workout. Or they're there for you if you simply need something to snack on. Protein content does not have to be at the expense of taste. Raw cocoa beans, walnuts, almonds and freeze-dried strawberries ensure the intense taste of our protein bar. Each bar provides a solid portion of protein. Made for performance. Without compromises. Raisins and hazelnuts? Not with us. Iranian pistachios and macadamia nuts meet goji berries and physalis. Together with cashew nuts, paranuts, sour cherries and mulberries they create a nutty-sweet and fruity-sour taste experience. In addition, they form an excellent nutritional profile. For your fitness. Apple. Intense as never before. Apples are healthy. Our apple rings are also particularly delicious and crunchy. Thanks to our patented drying process, they contain 80% of their natural vitamins. But dry fruits normally contain sugar, sulphur and artificial flavourings? Not with us. We simply rely on the dried fruit itself. Because pure nature is perfect. Do you like it savoury? Then our Beef Jerky is the ¨perfect match for you. 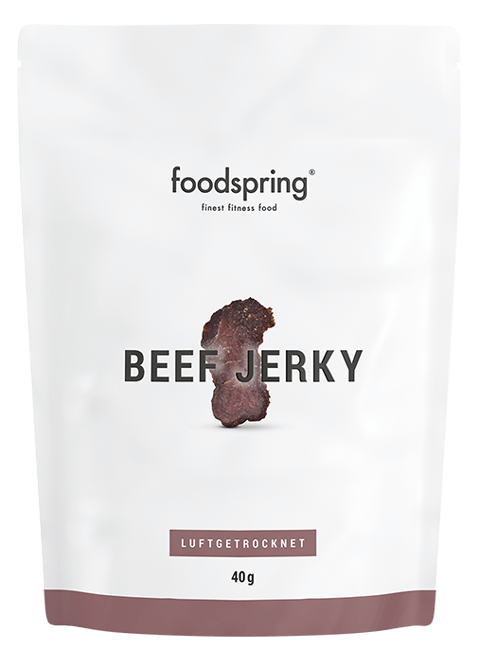 The meat for our Jerky comes from pasture-raised cows from the UK. It is degreased in loving manifacture and marinated with selected spices. Premium beef from British cows. Protein bar with raw cocoa bean splits and almonds. With sweetener. A varied and balanced diet and a healthy lifestyle are essential. May contain traces of gluten, egg protein and soy. Protein bar with real cocoa and almonds. With sweetener. A varied and balanced diet and a healthy lifestyle are essential. Excessive consumption may produce laxative effects. Despite careful monitoring, this product may contain hard pieces of fruit, nuts etc. Not suitable for people with the following allergies: Whey, milk, almonds. May contain traces of gluten, egg protein and soy. Protein bar with strawberry pieces, yogurt powder and walnuts. With sweetener. Because we use only natural ingredients and no colouring, the bar may change colour while in storage. This is a natural process and completely harmless. Please contact us if you'd like further information. A varied and balanced diet and a healthy lifestyle are essential. Not suitable for people with the following allergies: Cashews, almonds, brazil nuts, pistachios, macadamia nut, walnuts. May contain traces of: wheat. After your workout. Morning, afternoon, evening, between meals. 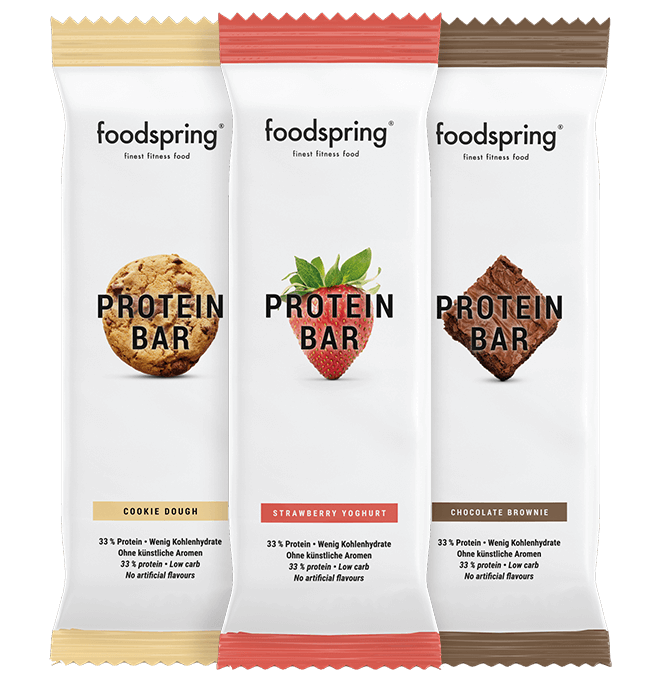 A suitable, filling protein snack wherever you go. Protein bars are especially useful when you are feeling a bit peckish and have no other sensible snacks at hand. Protein bars are also a quick and simple solution on days when you are just not sure if you have had enough protein intake. Protein bars as a dessert. We admit it: Protein bars are delicious, but are far from cake. Even so, they are a sensible and delicious alternative for cakes etc. when you are muscle building or body sculpting. Nuts and berries are the perfect snack to be enjoyed at any time. A handful of nuts and berries can satisfy hunger, especially in the evening and provides valuable energy after strenuous exercise. If on a diet you should enjoy nuts and berries in moderation, because of their relatively high calorie content. Add 2 - 3 tbsp. of nut and berry mix to your muesli or porridge in the morning. This makes a delicious, balanced breakfast which provides you with the energy you need to start the day. That depends on the snacks. It is true that you should not constantly nibble. Healthy snacks between the main meals are quite reasonable. It is important that you pay attention to a balanced nutrient composition. Recommendable snacks consist of high-quality proteins, healthy fats, fibers and complex carbohydrates. 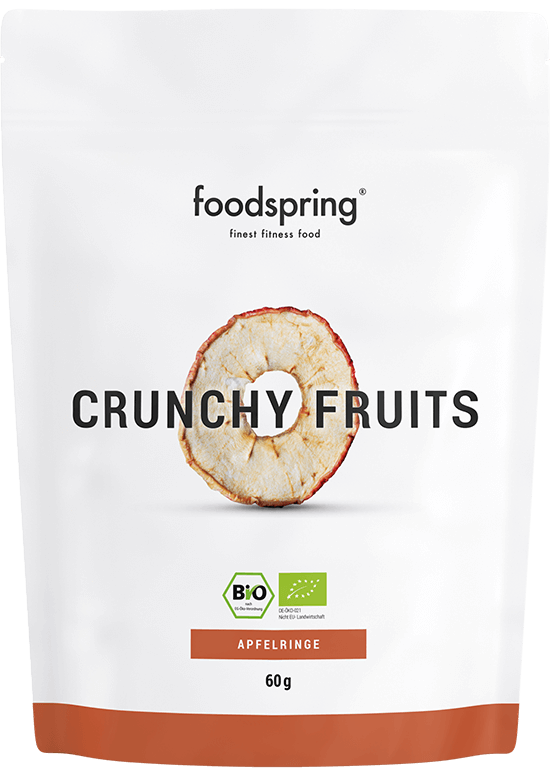 When it has to be quick energy, our crunchy apple crisps are perfect - they even add more vitamins. 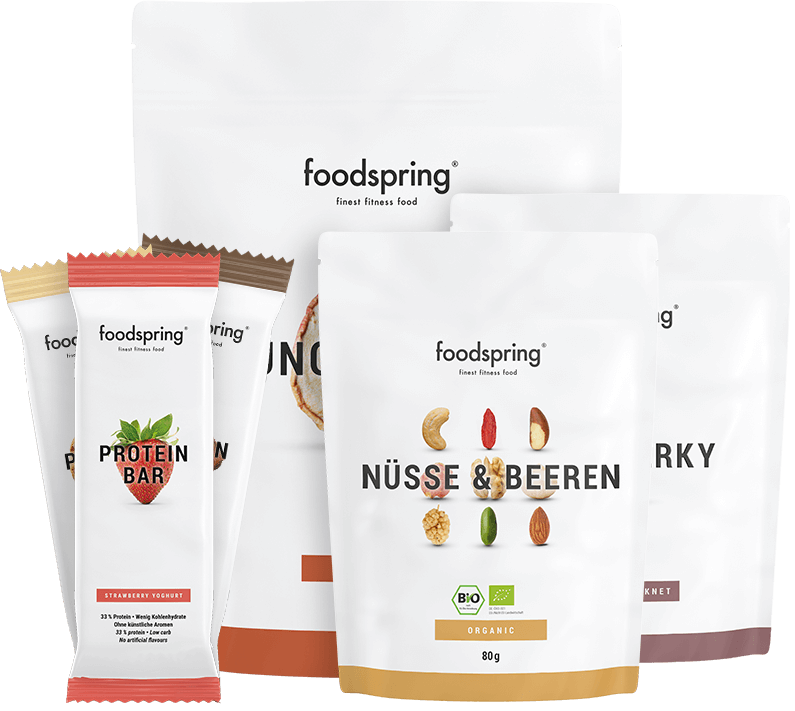 Was makes foodspring protein bars special? Raw cocoa bean splinters, freeze-dried strawberries, real almonds and walnuts. Our protein bars have wonderfully flavoursome, natural ingredients that give it its uniquely intensive taste. We use natural flavourings instead of chemicals to intensify the taste. Our bar gets its sweetness from steviol glycosides extracted from stevia plants. Added sugar? Of course not. A classic trail mix often contains large quantities of inferior ingredients, such as raisins or grapes. These mixes are often processed with artificial additives, added salt or sweeteners. 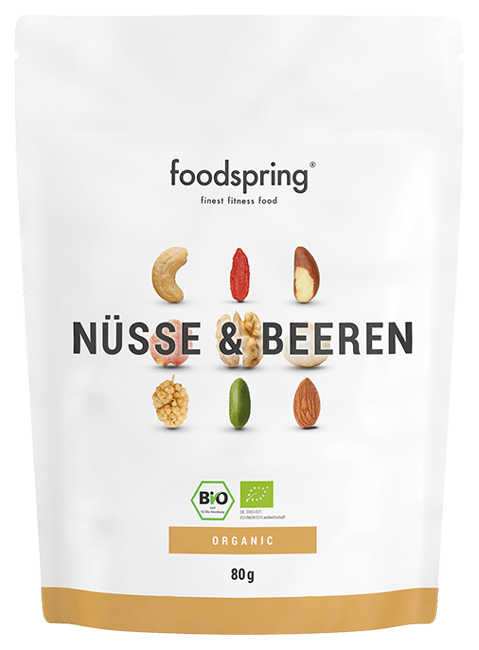 Through our unique combination of exclusive 100% natural nuts and berries, we strive to provide you with a completely different product and want to set new standards in the world of nuts and berries. Why should I eat dried apples? Because they're handy. They won't go bad or mushy, you don't have to eat them all at once and they'll taste great even after a week in your bag. And the best: They still retain up to 80% of the original nutrients. Healthy, handy, great. The Brazil nut doesn't enjoy the reputation it deserves. We think that’s a shame. The Brazil has the highest selenium content of any food. Cells need the trace element selenium to combat free radicals. And selenium is also a component of important enzymes. You will quickly discover that the Brazil nut not only tastes great but is also a nutritional delicacy. And don’t forget about the Brazil nut effect. This refers to the phenomenon of how when a pack is shaken, the largest items always end up on top. So when you shake the Nut and berry mix, you are sure to find a Brazil nut right at the top. Snack-Pack will be back in stock shortly.